These beautiful kits by embroiderer Becky Hogg feature woodland animals which are created using traditional Metalwork techniques. 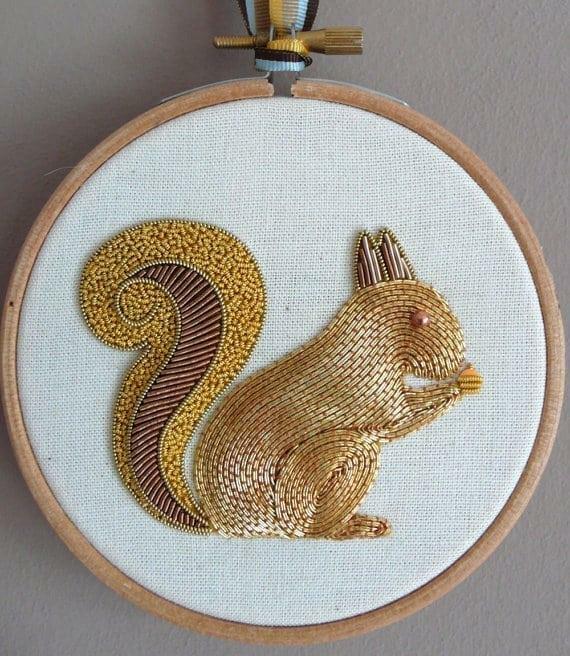 The kit includes all materials and clear step by step instructions to complete your handsome Squirrel and once completed can be mounted and hung in the little wooden hoop provided. Becky Hogg is master of her craft with a contemporary outlook who intricately works her knowledge of traditional skills into a wealth of projects; to the lace appliqué on the wedding dress of the Duchess of Cambridge to embroidery for Alexander McQueen's couture collections. All the kits are designed by Becky Hogg Embroidery and produced in the U.K. This kit is suitable for all levels, but not advisable for children.